On the eve of the release of Diablo III, I've been hearing chatter about the great Diablo series from office colleagues who I didn't even realize were fans. It turns out, for example, that Greg from finance not only loves Diablo, but he used scam people in it. Today, the man who cuts my paychecks is reformed (thank goodness!) and wants to warn you about the kind of shady dealings that occur in games like these. - Stephen Totilo, Editor-in-Chief, Kotaku. Future Diablo III players beware. The Diablo universe isn't known for being a friendly and welcoming place. There is a darker side to Diablo and its players. This is your warning. The series' creators at Blizzard didn't intend for this in Diablo II, but it was inevitable. As players quickly realized that in-game gold was worthless, rare and unique items became the game's currency. This created an interesting economic structure and "class" system, for lack of a better word. I don't mean "class" as in Barbarian or Sorceress, I mean it as in "rich" and "poor". There was always someone richer than you in Diablo II, which fueled feelings of jealousy and resentment towards others. This is the real reason Diablo II had so much replay value. There was no light at the end of the richness tunnel and everyone wanted more, more, more. Players became obsessed with obtaining the best items and didn't care what it took to get them. Eventually, the rich saw this as an opportunity and the poor became blinded by hope and desire. This is what Diablo II was about back then. Am I proud of this? No. 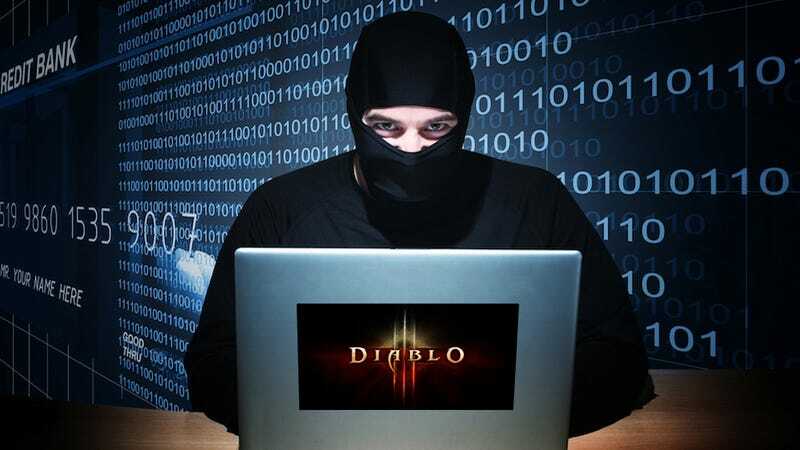 If you log in to Diablo II today, bots will continuously spam you via private messages and public chat rooms to buy in-game items for real money. It wasn't always like this and rare items weren't so common. Early on, the only way to obtain rare items was to find them yourself, trade for them, or take the most devious option and scam somebody for them. I started playing Diablo II shortly after its release in the summer of 2000. I was 14 years old and had a ton of free time. Once I got hooked, I got a few of my real-life friends hooked and we would play for hours on end. We shared items, made powerful in-game friends, and quickly became rich. Being rich wasn't enough for us. We wanted more, so we turned to scamming. We worked together, very efficiently, to deceive and steal from other players. Long story short, we scammed items, stole accounts, and made people very, very angry. For what? This is what Diablo II was about back then. Am I proud of this? No, but at the time it was acceptable. Diablo exemplifies the greed in people. Everyone wants its loot. There were always tons of scams going on, and anyone who has ever played Diablo II has most certainly dealt with some. Players were doing what they had to do to become the best. Players constantly took advantage of those who had less than them. The most successful scammers in Diablo II were the ones who actually had rare items and flaunted them. They were the ones who gained the blind trust of the poor. Diablo II taught me an important real-life lesson at a young age: "Don't trust anybody". This post serves as my warning to future Diablo III players. Trust your gut. Many people don't really want to help you and nothing is free. If it seems too good to be true, it probably is. That was the unintentional beauty of Diablo II. That's what made it so damn fun. DND Scam—The scammer will ask you for your "Dueling and Damage" or "Diablo Network Database" ranking, rating, etc. in order to join their clan or receive a free item. They will tell you to type /DND (account name) (password). The trick is that "/DND" actually stands for Do Not Disturb, It is a Battlet.net command that creates an away message. The scammer will private message you and your away message will automatically respond with your account information. Trade Window Scam—The scammer will show you a rare item in the trade window that they are willing to trade. Before the trade goes through they will exit the trade window and say it was a mistake. When you re-enter the trade window, they will try and trade you an item that looks the same on the surface, but it isn't the same rare item. Always check to make sure you're getting what you are supposed to in a trade. Rush Payment Scam—The scammer will offer to rush your new character to the end game areas for a price. They will ask for half of the payment up front and half at completion. When you give them the up-front payment they will take it and leave the game without helping you. Were you ever scammed when you played Diablo II? Did you scam people? Tell your story in the comments, and have fun playing Diablo III, hopefully scam-free!